I had the opportunity to go to the 5th Annual International ROV Competition organized by the Marine Advanced technology education Center, MATE. 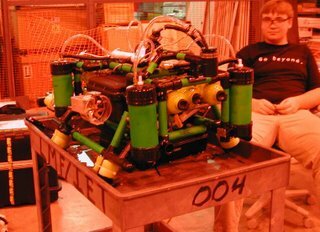 The competition is for college and high school teams to perform underwater tasks with ROV's that they have designed and built themselves. 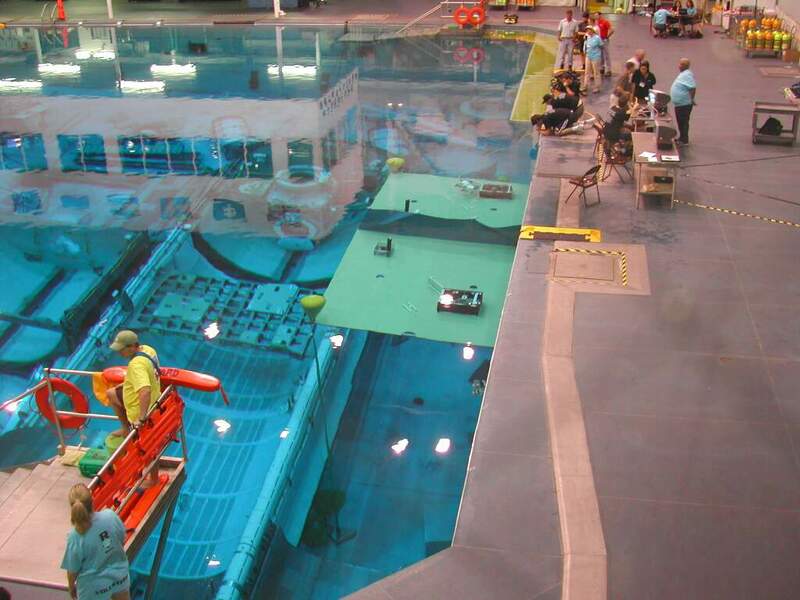 The underwater action took place at the NASA Johnson Space Center neutral buoyancy pool in Houston Texas. I was very impressed with the professionalism of the ROV designs and the teams. There were more than 40 teams competing from all over the US, Canada and a few from Hong Kong. The teams at this event got there by winning a regional contest. 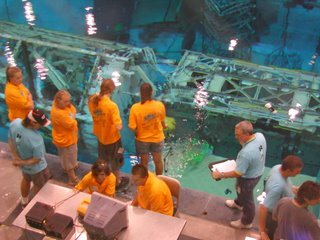 The contest venue, the NASA neutral buoyancy lab, is impressive by itself. It is the giant swimming pool where astronauts train for weightless work in space. It has mock-ups of the international space station and space shuttle cargo bays under the water. The MATE group used just a small portion of the pool. It is hard to convey the scale of the pool with pictures from a little digital camera. In the picture above you can see the contest platform at the right end of the pool where the people are standing. Below it in the water is the space shuttle cargo bay mock-up. You can also see the reflection of the second story control room. 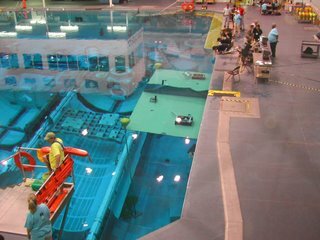 There were operating video cameras underwater so you could watch the live action from the control rooms and display area. The judging is not only on the ROV and performance during the tasks but the teams also have to present to technical judges. I talked to a few of the teams and found them all to be way smarter than I was at that age. They knew about their ROV but also knew about other designs. They were somewhat restricted by the rules of the contest and almost everyone I talked to told me about ways that they could make their machine go faster or lift more weight. One group I spoke with was the Falcon Robotics Team from Carl Hayden High School in Phoenix, Arizona. I did not know at the time that they were already sort of famous. There have been articles and maybe an upcoming movie about them. The team started with a bunch of high school kids who were on the verge of dropping out of school from dis-interest, need to get a job, citizenship problems, etc, - to go on to beat MIT in a national competition. An inspirational story. At the time, I was just grateful that they took the time out to explain everything to me. Their control system was particularly impressive. 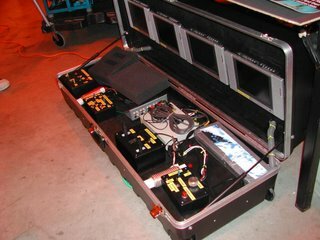 Everything, including the video monitors, was mounted in a travel case such that it just popped open ready to use. Another team I talked to briefly was from COSI Academy in Columbus, Ohio. This was a bunch of kids from different high schools who formed the team through the science museum. I was attracted to their work area by their very well constructed ROB. It was a very symmetrical, a nice green color and just looked like there was a lot of work in it. Yes, I am easily amazed. However, the real story of most of the teams is not about the ROV but about how they got there. In most cases, especially among the high school teams, the kids really drive the program. It seems that one of their toughest problems can be finding sponsors both for money and for guidance for the teams. The amount of work and creativity that goes into these projects is not something that you could tell someone to go out and do. The teams are completely self-motivated to invent this incredible new stuff.